The 1500-Calorie-a-Day Cookbook is written by Nancy Hughes, who is also the author of The 1,200-Calorie-a-Day Menu and has created recipes for Weight Watchers, the American Diabetes Association and the American Heart Association. This book provides a large selection of recipes that are suitable for a reduced-calorie diet without requiring dieters to sacrifice flavor and variety. Hughes created the recipes with the goal that they will be both low-calorie as well as delicious so that you will find it easy to stick with your diet. Hughes believes that meals should be fast and easy to prepare, as well as being healthy and tasty. There is a lot of variety included in the recipes in the book so that you should be able to find meals and snacks that appeal to you regardless of your food preferences. The recipes in The 1500 Calorie Cookbook are separated into sections for breakfast, lunch, dinner, dessert and snacks. For all of the recipes a calorie count and full nutritional information is provided. The main meals provide 350 calories and the snacks and dessert recipes provide 150 calories. Each day dieters select three main meals, two healthy snacks and one dessert to bring the total calorie intake to 1500. Fruit, vegetables, oatmeal, pancakes, waffles, tortillas, eggs, pork, chicken, fish, beans, light mayonnaise, diet margarine, fat-free milk. 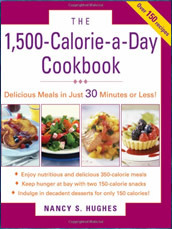 The 1500-Calorie-a-Day Cookbook retails at $14.95. Recipes contain a lot of variety and will appeal to most dieters. Portion sizes are large enough for meals to be satisfying. Meals take less than thirty minutes to prepare. 1500 calories may be too low for physically active dieters. Lacking in choices for vegetarians and vegans. Includes a large amount of pork recipes. Does not include a daily menu guide. Many of the lunch recipes are not easy to take to work or school. Dieters must be careful to check serving sizes as many recipes are for four servings. Does not encourage elimination of chemicals and preservatives. The 1500 Calorie a Day Diet Cookbook will appeal to dieters who want to reduce their calories but would prefer not to dramatically change their diet. It includes familiar foods and a lot of variety that will satisfy the taste preferences of most dieters. The major drawback of the book is the lack of choices for vegetarians as well as the inclusion of some processed foods and ‘diet foods’ in the recipes that contain chemicals and preservatives.